The owner of the Kings XI Punjab side, Preity Zinta has been in the news for all the wrong reason this Indian Premier League. After news of her spat with coach ad veteran Indian ex-opener Virender Sehwag became public, Zinta came under much fire from not only Sehwag’s fans but cricket lovers the world over. As per news, Zinta had gone on a spree, shouting at Sehwag for a good period of time, claiming he was the reason for her sides defeat. And Zinta has done no favours to herself, after a video of her realised, celebrating Mumbai Indians exit from the tournament after their loss to the Delhi Daredevils. Being bashed on social media, Zinta took to Twitter recently in an attempt to clean her image. 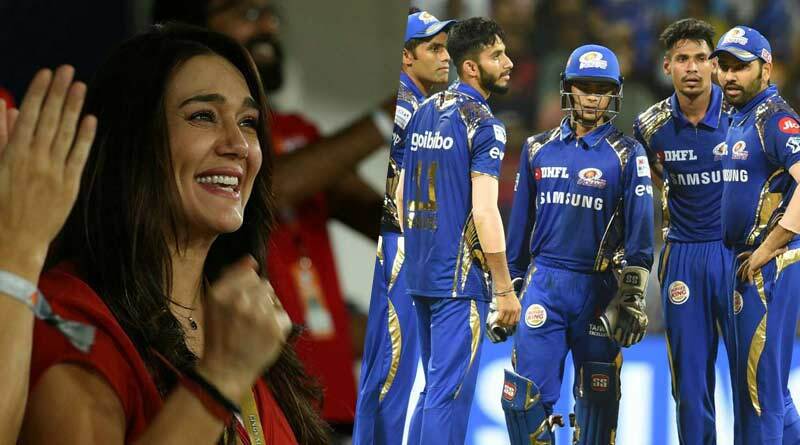 A video that went viral on the social media sees Preity Zinta celebrating Mumbai Indians demise rather than mourning her own team’s demise. The actress is seen turning to a fellow KXIP entourage member and mouthing what looks to be like: “I am just very happy that Mumbai is not going to the finals … really happy.” With people all over the world shocked at her reaction, Zinta tried her best attempt at covering the incident. She went onto tweet regarding the matter: Relax! Only if Mumbai was “Knocked Out” Punjab would have had a chance of getting to the playoffs but RR was happier we were Knocked out by CSK cuz they got to go to the playoffs! When you leave it till the end one has to not just see your wins but other teams losses as well”, she wrote. While her explanation is totally logical, viewers are not buying it, given the joy that was clearly visible on her face which speaks of another agenda. Zinta didn’t stop tweeting there though. She also went onto issue an apology to the supporters of KXIP for not making the playoffs. “Who would have thought that after winning 5 out of 6 games, in the beginning, @lionsdenkxip would have ended the #Ipl on this note. I’m sorry to all our fans & supporters for not being up to the mark this season. Next year we won’t let you down. #disappointed”, Preity Zinta added in another tweet.